Finally, despite the fact that the Palestinian Authority, Abbas, and prime minister Rami al Hamdallah received little positive evaluation for their role during the war, a majority tends to give the reconciliation government a big role in the affairs of the Gaza Strip in the post war period. For example, a majority wants it to control border crossings and to supervise police and security sector employees; the largest percentage wants it to control borders with Israel and Egypt and to lead the reconstruction process in the Strip. 79% believe that Hamas has won the Gaza War; 3% believe Israel came out the winner; and 17% believe the two sides were losers. 79% believe Israel was responsible for the eruption of the Gaza war; 5% believe Hamas was responsible; and 12% believe the responsibility lies with the two sides. 63% believe that the ceasefire agreement satisfies Palestinian interests, but 34% disagree with that. Moreover, 59% are satisfied with the accomplishment gained in the agreement compared to the human and material losses sustained by the Gaza Strip; 39% are dissatisfied with the accomplishment. 60% say that Hamas does not launch rockets from populated areas, but 30% say it does. 49% think it is justified for Hamas to launch rockets from populated areas and 46% disagree with that. Percentage of those who believe that launching rockets from populated areas is unjustified increases to 59% among Gazans while standing at 38% among West Bankers. Only 30% believe that Hamas should warn Israeli civilians in the specific targeted areas before launching its rockets; 68% believe it should not do so. 57% oppose disarming armed groups in the Gaza Strip while 25% support such a measure after the ending of the siege and the conduct of elections; 13% support this measure but only after reaching a peace agreement with Israel. In our June 2014 poll, only 33% said it opposed disarming and dissolving armed groups in the Gaza Strip. Despite the current opposition to disarming Gaza groups, a majority of 54% support and 40% oppose Abbas’ position that argues that the reconciliation government must be committed to existing agreements reached between the PLO and Israel and rejects Hamas position that opposes Abbas’ argument. In our previous poll in June, support for Abbas’ position stood at 59%. Yet, only 43%, compared to 53% last June, agrees with the statement that the inclusion of Hamas into the PLO means an implicit acceptance by Hamas of the PLO peace program and the existing agreements with Israel. About two thirds (64%) believe that Iran, Turkey and Qatar combined have given the Gaza Strip the ability to remain steadfast against Israeli attacks and to be able to continue to launch rockets during the war; only 9% believe Egypt too has contributed to that. Iran comes on top with 28%, followed by Turkey (21%) and Qatar (15%); 25% select other countries or actors. Moreover, only 25% describe Egypt’s role in the ceasefire negotiations as positive while a majority of 52% describe it as negative and 22% as neutral. 94% are satisfied with Hamas’ military performance in confronting Israeli forces; 78% are satisfied with its defense of civilians in Gaza; and 89% are satisfied with its media and communication performance. Optimism about the success of reconciliation and the end of the split rises to 69%; 28% remain pessimistic. In our last poll in June 62% were optimistic. Three months after its establishment, 46% are satisfied with the performance of the reconciliation government and 46% are dissatisfied. Indeed, 60% prefer to get rid of the reconciliation government and form a unity government in which leaders and politicians from all major factions would participate; 34% oppose such a step and prefer to keep the reconciliation government. The preference for a unity government drops significantly to 49% in the Gaza Strip and increases to 66% in the West Bank. A majority of 51% wants to place the reconciliation government in charge of the Rafah crossing, but 38% prefer to keep it under Hamas’ control. In the Gaza Strip, 64% want to place the Rafah crossing under the control of the reconciliation government and only 25% want it under Hamas’ control. The same, with minor variation, applies to control over the crossings with Israel. 48% want the reconciliation government to control the border with Egypt and 39% want it under Hamas’ control. The same, with minor variation, applies to the border with Israel; with 45% in favor of keeping the border under the control of the reconciliation government and 41% say they should stay under Hamas’ control. In the Gaza Strip, 56% say borders with Egypt should come under the control of the reconciliation government and 49% say the border with Israel too should come under the control of the reconciliation government. 65% want the reconciliation government to be in charge of supervising the work of the employees of Gaza security sector who worked in the past under Hamas government; 29% disagree with that, wanting instead to keep these employees under Hamas’ control. In the Gaza Strip, the demand for placing the security sector employees under the control of the reconciliation government rises to 72% and only 24% want them under Hamas’ control. Nonetheless, 72% agree with Hamas’ demand that security and police should remain under its control during the next 6 months, up until the elections; 24% disagree with that. Two months ago 66% agreed with that. If new presidential elections are held today and only two were nominated, Haniyeh, for the first time since we have started asking about his popularity about 8 years ago, would receive a majority of 61% and Abbas would receive 32%. Vote for Haniyeh stands at 53% in the Gaza Strip and 66% in the West Bank. Abbas receives 43% in the Gaza Strip and 25% in the West Bank. Two months ago, Abbas received the support of 53% in the West Bank and the Gaza Strip and Haniyeh 41%. The rate of participation in such elections would reach 71%. If presidential elections were between Marwan Barghouti and Haniyeh, the former would receive 45% and the latter would receive 49% of the participants’ votes. This is the first time in 8 years in which Haniyeh receives more votes than Barghouti. In our previous poll, Barghouti received the support of 58% and Haniyeh 38%. The rate of participation in this case would reach 77%. If presidential elections were between three: Mahmud Abbas, Marwan Barghouti and Ismail Haniyeh, Haniyeh would receive 48% of the vote, Barghouti 29%, and Abbas 19%. The rate of participation in this case would reach 80%. In our previous poll in June 2014, Barghouti received 36% of the vote, Haniyeh 33%, and Abbas 28%. Findings show that the percentage of Gazans who say they seek immigration to other countries stands at 43%; in the West Bank, the percentage stands at 20%. For the first time ever, Hamas’ official TV station, Al Aqsa, is the one with the most viewership (37%) in both the West Bank and the Gaza Strip followed by al Jazeera (21%), Palestine TV (16%), Ma’an-Mix (11%), and al Arabiya (5%). The public is divided over the two-state solution: 49% support it and 50% oppose it. In our last poll two months ago, 54% supported this solution and 46% opposed it. A majority of 53% believe that armed confrontation is the most effective means to establish a Palestinian state next to the state of Israel. Only 22% believe negotiation is the best means to establish a Palestinian state and 20% believe that popular non-violent resistance is the most effective route to statehood. 62% say that the two-state solution is no longer practical due to Israeli settlement expansion and 35% think it is still practical. Yet, only 24% support the alternative one-state solution; 75% reject the one-state solution. These findings indicate a drop in the support for the one-state solution which two months ago stood at 31%. 81% are worried that they could be hurt by Israelis in their daily life or that their homes would be demolished and land confiscated. Only 19% are not worried. An overwhelming majority of 81% believe that Israel’s long term aspiration is to annex the land occupied in 1967 and expel its population or deny them their political rights. By contrast, 63% believe that the long term aspiration of the Palestinian Authority and the PLO is to recover part or all of the land occupied in 1967. 57% of the public say that they supported the June 2014 kidnapping of the three Israelis in the West Bank when that incident took place. Support for the kidnapping reached 67% in the Gaza Strip and only 45% in the West Bank. Similarly, a majority of 54% supported the killing of the three kidnapped Israelis and 42% opposed it. 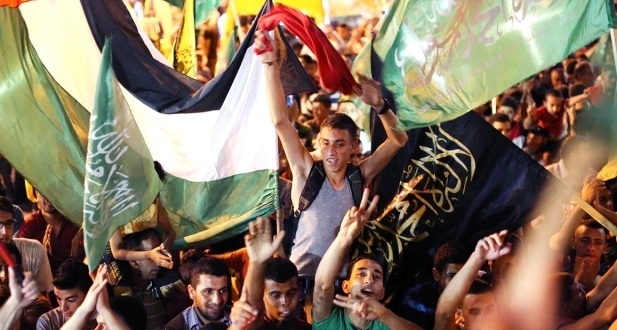 Support for the killing reached 69% in the Gaza Strip and only 42% in the West Bank. 52% of the West Bankers opposed the killing of the three kidnapped Israelis. The public is divided over the identity of those who carried out the kidnapping and the killing of the three Israelis: 32% accuse Israel, 30% accuse Hamas, 21% believe a Palestinian acted on his own, and 2% accuse Fatah. In the absence of viable negotiations, 85% support joining more international organizations; 84% support joining the International Criminal Court; 62% favor resort to popular non-violent resistance; 60% support a return to an armed intifada; 42% support a dissolution of the PA; and 24% support abandoning the two-state solution in favor of a one-state solution. It is worth mentioning that two months ago only 41% indicated support for a return to an armed intifada. 61% believe that massive popular demonstrations could contribute to ending the Israeli occupation. But a larger majority of 72% favors the transfer of Hamas’ armed approach to the West Bank. Support for emulating Hamas in the West Bank stands at 70% among West Bankers and 74% among Gazans. 82% say they participate in boycotting Israeli goods that have local alternatives and 18% say they do not participate in the boycott. An overwhelming majority believes that the boycott movement is effective and 11% believe it to be ineffective.